Tasmania’s second worst shipwreck was that of the female convict ship Neva, wrecked on reefs north of King Island on 13 May 1835 with the loss of 224 lives. 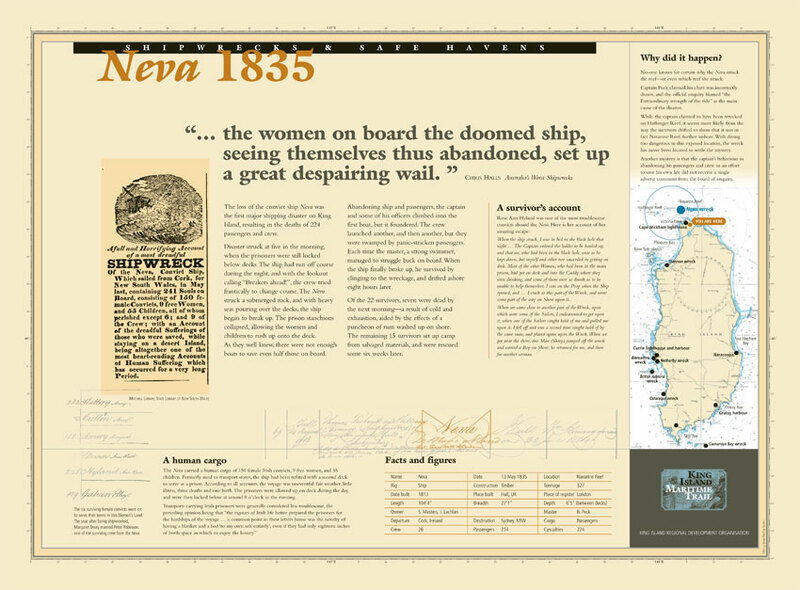 The Neva sailed from Cork, Ireland for Sydney on 8 January 1835 carrying 150 female convicts with 33 children, nine free women (probably wives of convicts) with 22 children, under the care of Surgeon Superintendent John Stephenson, R.N., and 26 crew under the command of Captain Benjamin Peck. The voyage, unlike that of the George III at the same time, was almost completely free of incident and illness. With the deaths of a crewman, a convict and a free woman, and one birth, during the voyage, by the time the Australian coastline was reached the total complement was 239. At noon on 12 May the ship’s position was calculated as being 90 miles west of King Island and a course was shaped to pass 14 miles north of the Harbinger Reefs at the island’s northern end. At around 2 a.m. on the 13th, however, land was seen an estimated nine miles ahead and Peck ordered a more northerly course. Three hours later the lookout called the dreaded warning “breakers ahead!” The helm was put over hard to starboard and the ship went about with her head into the wind, but she suddenly struck a submerged rock and her rudder was carried away. While efforts were made to get her back under control, her bow struck the main reef and she swung broadside on. With heavy seas breaking over her, the Neva was soon bilged and filled with water, and the cutting away of the fore-mast and main and mizzen top masts did little to help. The straining of the hull caused the prison stanchions to collapse, and soon there were 200 panic-stricken women and children on deck. Many ran straight to the poop and cuddy where the Government stores, including rum, were held. The liquor was broached and many of the women were soon helplessly drunk, some to be killed when the poop collapsed in on them as the ship broke up. All efforts to launch the boats ended in disaster. Captain Peck escaping the swamping of two of the boats, including the long-boat which was overwhelmed by the panicking women. Finally, the ship completely broke up, parting in two amidships, then the upper works of both sections floated up from the bottom to form two rafts. Fortunately, the wind and current were in the right direction as the rafts drifted towards the shore of King Island, carrying the few remaining survivors. The forward deck, with the mast still sticking through it, grounded about three-quarters of a mile offshore and broke up. Of about 20 people on board only three, including Captain Peck, managed to swim ashore. The other raft was more fortunate, drifting onto a beach where the 19 on board, including Chief Officer Bennett, stepped ashore with ease. However, with discipline restored, and a rough shelter erected from timber washed ashore, along with a few undamaged casks of flour and salt pork, the position looked somewhat improved. Hopeful of finding further castaways, Peck and Bennett, each with two of the crew, headed in opposite directions. Ninety-five bodies were found and buried in shallow graves but no more survivors were located. A fortnight after the wreck, the castaways met up with two of the crew of the Tartar, about 30 miles to the south-east earlier in the month. They led the survivors to the nearby hut of a sealer John Scott, who provided them wallabies killed by his dogs. Early in June the schooner Sarah Ann arrived at New Year Island, with Charles Friend searching for his missing Tartar, and met up with the cutter’s crew and 12 of the Neva’s survivors, two men and a woman apparently being off hunting at the time. The Sarah Ann took Peck on board and headed for her original destination of Port Fairy, but, headed by heavy gales, returned to New Year Island where it was decided to pick up the rest of the Neva survivors and take them to Launceston. One woman, Rose Hyland, objected to leaving the island, leveling a pistol at Friend and Bennett, and had to be overpowered before being carried on board the schooner. The Sarah Ann finally arrived at George Town on 26 June and the Neva survivors were soon at Launceston. The Government cutter Charlotte was sent to King Island to pick up the three survivors who were still off hunting when the Sarah Ann left, and an inquiry was held, exonerating Pick from any blame for the loss of the ship. Initial press reports are adamant that the Neva was wrecked on the Navarine Reefs, which lie north-east of Cape Wickham. However, the inquiry went to considerable lengths to demonstrate that the ship had run onto the Harbinger Reefs, north-west of the Cape and twice as far from it as the Navarines. It is a mystery that will not be solved till the treacherous waters north of King Island receive a thorough survey. Neva was a barque of 327 tons, 104ft.4in. x 27ft.1in x 6ft.5in. between decks, built at Hull, England by Firbank and Rumney in 1813, and was registered at London in the names of S. Masters and J. Lachlan. REFERENCES; AOT 1/17293 & HRA 1, Vol. 18, pp. 136-150; CChron 27 June, 4 July 1835; Mawer, Most Perfectly Safe, pp. 78-94; Reg. London 170/1833.